Annual UJA Event Makes Philanthropy "Fashionable"
By Jessica Taylor--UJA’s Community Connect proudly hosted its 5th annual BAC2Fashion initiative recently, and, thanks to all involved in this popular and successful annual fundraiser, approximately $55,000 was raised to support a number of UJA seniors’ programs. So far, BAC2Fashion has raised over $200,000 to support essential programming, while engaging hundreds of individuals in their 20’s & 30’s in meaningful volunteer work. 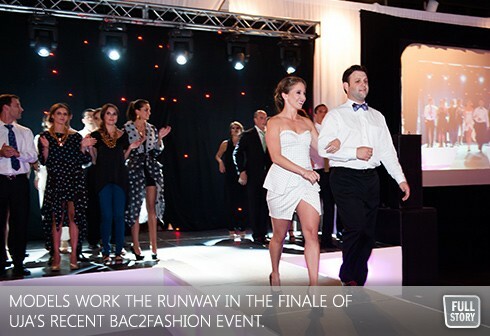 Funds raised through BAC2Fashion will be directed towards UJA’s senior’s initiatives such as Circle of Care, social programs at Bernard Betel, Healthy at Home, transportation for seniors, and The Holocaust program at JF&C, to name a few. These programs are vital for helping minimize the isolation many seniors face and keep them living active, healthy, and fulfilling lives. The gala event, held at the Warehouse Event Venue, began with a cocktail reception complete with the sounds of Tino Pop Violin, before the highlight of the evening – the runway show – began. The clothing from nine top Toronto fashion providers, wowed the crowd, as did a number of live musical and dance performances including Canada’s own pop sensation Danny Fernandes, who made a special appearance. Fashions showcased on the BAC2Fashion runway included Over the Rainbow, Shenkin West, Intuition Men+Women, and Tana+Bee all returning for another round. New additions for 2013 included Cloakroom, Christopher Bates, Bustle Clothing, Millenium Group, Jerome’s, as well as jewelry provided by Ellie B. The event run through UJA’s Community Connect was spearheaded by 4 emerging community leaders: Aly Paisley, Nicole Inwentash, Carly Goldberg and Jordana Hart, all of whom are in their early 20’s. “As chairs, our goals this year were to educate our community on the plight of vulnerable seniors, to engage young adults, and to raise funds for seniors and the programs which change their lives,” said Goldberg.